When you become a pensioner it's compulsory to go on coach tours. An ad from Newmarket in the Argus caught my eye - Rails Peaks and Fells - I love railways (ironic isn't it) and some of the heritage ones are a bit difficult to access by public transport, so I thought I'd give it a go. It was also incredibly cheap (£150 for two nights in a hotel, all the tickets and three-days travel). Friday was tedious - I had to get myself down to the pier by 7.25, and I was the only one from Brighton. Then it was hours of pick-ups, from Burgess Hill and Crawley to Staines and Hemel Hempstead, then being stuck in traffic jams on the M6, lots of visits to motorway services, and finally our hotel - the Britannia in Bolton! The food was surprisingly tasty and it was happy hour in the bar (£1.50 for a pint of John Smiths) both nights until 9pm - the TV was crap tho (no Freeview), so it was Torchwood and an early night. Saturday was tons better. We set off at 9am through north Lancs to Settle, with some lovely scenery on the way. Weather was bright and we had a good ride on the Settle to Carlisle route on the regular diesel, with our guide Eric. Shame we couldn't have seen the route by helicopter - caught only the briefest glimpse of Ribblehead Viaduct. In Carlisle had lunch in the cathedral tearoom with Tessa the unaccompanied lady (we three waifs and strays - me , Andrew and Tessa - sat together at meals) and a browse round the charity shops (bought a book on the 1938 Empire exhibition at Oxfam) then it was back on the coach to the Lakes. The Kirkstone Pass and views of Ullswater were breathtaking - you need a coach to see that! Windermere and Bowness were basically a tea break (but I did buy a flat cap for £3.99 plus 10% discount! ), then it was back to Bolton, where I managed to escape for an hour of two after dinner to see my family in Bury. We'd seen boxing bunnies, magpies, baby ba-lambs, pheasants, lots of plastic bags in trees, a grouse (well, it looked like the bird on the whisky bottle), snow, daffs, primroses, waterfalls and lots of steep hills. Sunday we went straight down to the potteries to take in the factory shops at Spode and Wedgwood. We should have done them Friday, but cos of motorway delays it was today. I actually bought something (a bowl and mug - some china made in China)! Then after a brief stop in Telford services where the sandwiches were too dear to contemplate, it was off to the two-level town of Bridgenorth and the Severn Valley Railway. After a bowl of chips in the cafe and a wander round taking snaps of locos (45110, 48773 and 7802 Bradley Manor were in the yard), I grabbed a pint of Dark Raven and jumped on the 2.30 to Kidderminster. We were pulled by 88 (53808), a 2-8-0 from Minehead in the colours of the Somerset & Dorset Joint Railway. I had my head out of the window right by the front of this magnificent loco (it was going backwards) and it made a gorgeous sound (got told off for making a draught!). Coming into the station as we were leaving was 7812 Erlestoke Manor, and on the way we saw GWR pannier tank 7714, mickey 42968, and Prairie 4566, which was taking the train back to Bridgend. Six locos were in steam that day! 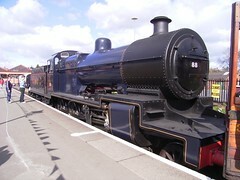 Full list of locos on Wikipedia. Then it was off home, with a pint of Abbot ale in Crawley (I was told to remove my wooly hat in the pub!) while driver Don got his 30 minute EU regulation break. He kindly dropped me off at the bottom of Ditchling Rise, so it was home for Casualty 1907. The verdict: despite the tedium of Friday, it was a very pleasant experience overall. Coach travel is very comfortable and you're taken everywhere door to door. We had a helpful Janet the Tour Manager and the hotel, whilst being remote (by the motorway for businessmen), was comfortable and the food surprisingly good, with meat, fish and veggie both nights. Evenings could have been a problem - must get the laptop sorted. We could have had longer on the railways, but it was a great taster, and we saw lots you probably wouldn't see as an independent traveller.